A little over a year ago my son Anthony talked me into looking for another dog. I had recently lost my husband and my dog Patches (who I’d had for 18 yrs.). I really didn’t want to get another dog but he said a dog would keep me company and help me heal. Finally he convinced me it would be a good thing. So, we looked every day off that he had from work, for months. I was looking for a dog that was medium size so I could take it on walks with me around the neighborhood when we moved to Zephyrhills. I just could not find the right dog for me. We looked and looked. We looked at every dog shelter within a few hours drive. I kept telling Anthony that when I saw the dog I was meant to have I’d know it. One day we ended up in Sarasota. As I was walking, looking at all the dogs, I came to a pen that didn’t have a dog in it but I looked at the photo. I knew the second I saw her photo that she was was my dog. She was nothing like what I’d been looking for all those months. She was tiny, only 9 pounds. She was a smushed face dog (I never thought I’d have a smushed face dog). And she was long haired and looked like she need a good grooming. But that dog was mine the minute I saw her photo. I told my son to go find out where she was and prayed she was still available for adoption. He headed for the door to find someone who worked there & I read her info. It said she was a puppy mill survivor. I got the leaky eyes. As soon as he got to the door a man walked by. He had her in his arms. I told him I wanted her. He said that the person who was supposed to adopt her that day had just called to let them know she had changed her mind. Perfect timing. While we were filling out the papers to adopt her they put her back in her pen, and there were 3 other people that wanted her. 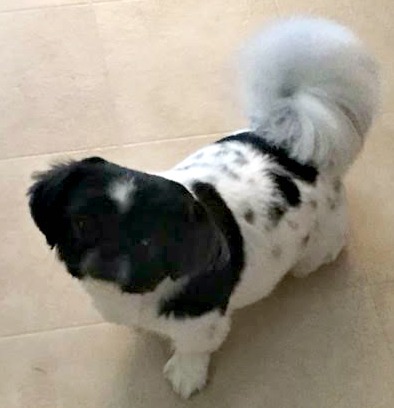 We took her home and the next day took her to the vet to make sure she was ok. She’s a Japanese Chin and they are supposed to have long hair, but I wanted it short since it’s so hot and humid in Florida, so we took her to the groomer and got her fur shampooed and cut. She was adorable with her new fur-do! She wasn’t housebroken even though she was 2 years old. She was shaky and nervous. She had a few teeth missing from not being taken care of. She wouldn’t go through a doorway unless you backed away from the door (I’ve been told that this was because she’d had doors slammed on her), and she didn’t know that she was supposed to play with toys, she’d just look at them and then forget about them. She wouldn’t walk with a leash, as soon as I put one on her, she froze. She’s over come most of those things, but we’re still working on a few of them. Now she is a happy little dog that loves to eat, loves making her toys squeak, and loves cuddling. Kaiyo is such a Blessing to me. She helped me heal (Anthony was right), and I helped her heal. I still miss Patches, I’ll always love and miss her. But Kaiyo is my baby too and I know Patches would approve. Happy One Year Anniversary Kaiyo! It sounds like the two of you are a perfect pair! Vicki, Kaiyo is so adorable and precious. Happy one year anniversary! You and Kaiyo are so lucky to have found each other. Happy “Gotcha” Day! We found our furbaby at the Humane Society’s website, and I, like you, just ‘knew’ she was the one for us. When we got her, she would not give me or my kids the time of day. She would just trot around the outside pen and sniff the air. I moved away from my kids that were patiently trying to get her to come to them and just stood quietly. About a minute after that, she casually strolled over to me and just leaned against me. That is when I knew we understood each other. We all have been very happy these last 2 and a half years. I love hearing stories like yours. Thank you for sharing! What an adorable addition to your family! Good on you for adopting.